This article is about the 2010 historical drama film. For the 1944 spy thriller film, see Conspirator. The Conspirator is a 2010 American mystery historical drama film directed by Robert Redford based on an original screenplay by James D. Solomon. It is the debut film of the American Film Company. The film tells the story of Mary Surratt, the only female conspirator charged in the Abraham Lincoln assassination and the first woman to be executed by the United States federal government. It stars James McAvoy, Robin Wright, Justin Long, Evan Rachel Wood, Jonathan Groff, Tom Wilkinson, Alexis Bledel, Kevin Kline, John Cullum, Toby Kebbell, and James Badge Dale. 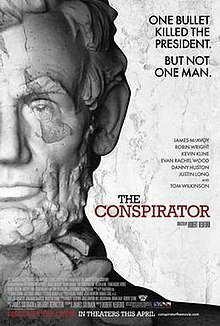 The Conspirator premiered at the Toronto International Film Festival on September 11, 2010 followed by a special premiere screening on March 29, 2011 at the Abraham Lincoln Presidential Library and Museum in Springfield, Illinois. Another premiere screening was held on April 10, 2011 at Ford's Theatre in Washington, D.C., the site of the assassination. The United States theatrical release took place on April 15, 2011, the 146th anniversary of the death of President Lincoln. The film was released in Canada on April 29, 2011 and was released in the UK on July 1, 2011. Lionsgate Home Entertainment released the DVD and Blu-ray on August 16, 2011. On April 14, 1865, five days after the Civil War ends with the South's surrender to the North at Appomattox Court House, Virginia, lawyer and Union veteran Frederick Aiken, with his friends, William Thomas Hamilton and Nicholas Baker, and girlfriend, Sarah Weston, celebrate. Later that same night, Southerner Lewis Payne seriously wounds Secretary of State William Seward in an unsuccessful assassination attempt. German immigrant and carriage repair business owner George Atzerodt is assigned to kill Vice President Andrew Johnson but becomes afraid and runs away. Meanwhile, actor John Wilkes Booth enters Ford's Theatre and sees his target, President Abraham Lincoln. Booth sneaks into the President's box and shoots Lincoln, mortally wounding him. Booth stabs diplomat and military officer Henry Rathbone who was a guest in Lincoln's box, and leaps onto the stage, shouting, "Sic Semper Tyrannis! The South is avenged!" before escaping. A crowd, including Aiken, Hamilton and Baker, watch in horror as the unconscious President is taken to a nearby boarding house where he dies early the next morning. Secretary of War Edwin Stanton orders all suspects, including Mary Surratt, arrested. Booth and David Herold manage to evade capture for some days, but Union soldiers find a barn where they suspect the conspirators are hiding and set it on fire. Herold is arrested, while Booth is shot and killed by sergeant Boston Corbett. Maryland Senator Reverdy Johnson is Mary Surratt's lawyer. Her son, John Surratt, had escaped with hundreds of agents looking for him. Feeling unable to defend Surratt because he's a Southerner, Reverdy asks Aiken, a Northerner, to take over, but he tries to refuse. He is ordered to defend her and tells Sarah and his friends, who are shocked to hear this. Aiken visits Mary in her cell to question her. Mary asks Aiken to look in on her daughter Anna. Aiken does so and searches the boarding house for clues. He finds a ticket with the initials "LJW" (Louis J. Weichmann). At the court, Weichman - a seminary friend of Mary's son John, is the first witness and describes John Surratt's meetings with Booth. Aiken incriminates Weichman, making him appear as guilty as the rest of the conspirators. Aiken again tries to give up defending Mary, believing her guilty. He meets with her, intending to get evidence of her guilt. She explains that John and the others conspired to kidnap Lincoln, not to kill him. They were about to attack a carriage but were stopped by Booth who reported that Lincoln was elsewhere. She says John left town and went into hiding after this, two weeks before the assassination. Aiken asks Anna for information to help with his trial preparations, but she refuses. At the court, Chief Prosecutor Joseph Holt brings Innkeeper John Lloyd to the stand. Lloyd claims that Mary sent binoculars to Booth and prepared shooting irons and whiskey for Booth and Herold on the night of the assassination. Aiken angers Lloyd, implying that he was bribed for his testimony in whiskey. Lloyd is dragged out of the courtroom after threatening Aiken. While attempting to attend a party at the Century Club, Aiken finds his membership has been revoked due to his defending Mary Surratt. This triggers an argument with Sarah and she disowns and leaves him. Aiken asks Anna to testify next. Anna testifies that Mary had no part in the assassination of Abraham Lincoln, but that it was her brother John instead. Anna visits Aiken at his house and tells him about Booth and John, and sends him to where John Surratt is hiding. He brings the message that John must surrender or his mother will hang for his crimes. On July 6, Mary is found guilty on all charges and, with Stanton's intervention, sentenced to hang with three others on the 7th. Aiken procures a writ of habeas corpus to try Mary in civilian court, but President Johnson suspends the writ and Mary is hanged. Sixteen months later, Aiken visits John Surratt, who was captured abroad and is in jail. John thanks him for his kindness to his mother. Aiken offers him Mary's rosary but he declines. The epilogue goes on to state that a year later the Supreme Court ruled that citizens were entitled to trial by a civilian jury and not a military tribunal, even in times of war (Ex parte Milligan), and that a jury of Northerners and Southerners could not agree on a verdict for John Surratt, and he was freed. Aiken left the law and became The Washington Post's first City Editor. Toby Kebbell as John Wilkes Booth, the man who assassinates Abraham Lincoln. Gerald Bestrom as Abraham Lincoln, the 16th President of the United States who is assassinated in the beginning of the film. Bestrom, who does not speak, was a professional Lincoln lookalike. He died in April 2012. Principal photography began in October 2009, in Savannah, Georgia and wrapped in December 2009. Fort Pulaski National Monument, located east of Savannah, served as the military prison in the film. The Mary E. Surratt Boarding House still stands, and is located at 604 H Street NW in Washington D.C.'s Chinatown. Mary Surratt's farmhouse in Clinton, Maryland, is now a museum. The town in which the farmhouse stands was originally called Surrattsville. The United States Post Office renamed the town Robeysville due to the notoriety of the Surratt name. In 1879, Robeysville was renamed Clinton. Upon its release, the film received a mixed reception from critics. Metacritic gave the film a weighted average score of 55/100 based on 37 reviews, indicating "mixed or average reviews". Rotten Tomatoes reports that 55% of critics have given the film a positive review based on 169 reviews, with an average score of 6.1/10. The website's critical consensus states that "The Conspirator is well cast and tells a worthy story, but many viewers will lack the patience for Redford's deliberate, stagebound approach." Critics have cited it as an analogy to the post-9/11 atmosphere. ^ a b "The Conspirator (2011)". Box Office Mojo. Retrieved September 16, 2012. ^ "Full cast and crew for 'The Conspirator'". IMDb. Retrieved 2011-02-14. ^ "Pics and Justin Long for Redford's Conspirator". NewsinFilm.com. 2009-10-16. Archived from the original on 2010-09-22. Retrieved 2011-01-02. ^ Grabert, Jessica (June 1, 2011). "The Conspirator Comes To Blu-Ray And DVD With A Slew Of Historical Extras". CinemaBlend. Retrieved July 5, 2011. ^ Uno, Lori Taki (August 15, 2011). "New DVDs – 'Jane Eyre,' 'The Conspirator,' 'Hoodwinked Too!'". The Seattle Times. Retrieved August 20, 2011. ^ Justin Kroll (2009-10-27). "Danny Huston". Variety. Retrieved 2009-12-05. ^ Borys Kit (2009-11-16). "Stephen Root cast in two films". The Hollywood Reporter. Archived from the original on November 20, 2009. Retrieved 2009-12-05. ^ Justin Kroll (2009-11-10). "Johnny Simmons". Variety. Retrieved 2009-12-05. ^ Goldberg, Matt (September 15, 2010). "BEAUTIFUL BOY, THE CONSPIRATOR, SUBMARINE, and INSIDIOUS Find Distributors at Toronto International Film Festival". Collider.com. Retrieved September 15, 2012. ^ "The Conspirator Reviews". Metacritic. CBS Interactive. Retrieved April 14, 2011. ^ "The Conspirator (2011)". Rotten Tomatoes. Fandango Media. Retrieved May 14, 2018. ^ 'The Conspirator' is a post-9/11 message movie. Are you as tired of post-9/11 message movies as I am? This page was last edited on 4 March 2019, at 04:13 (UTC).